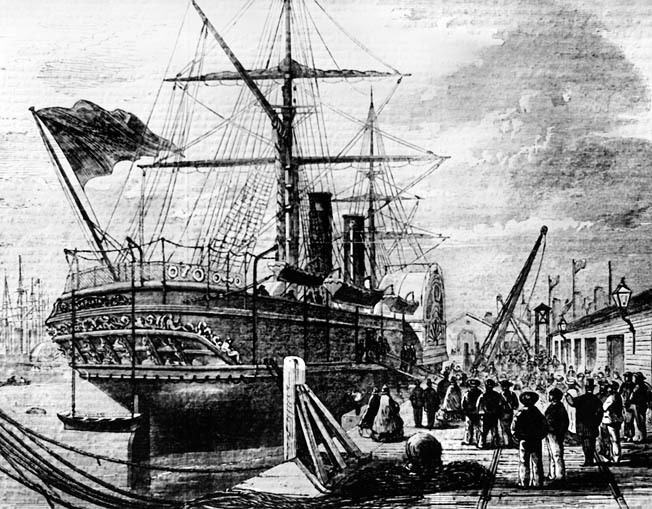 When the Union warship San Jacinto stopped a British mail steamer en route from Havana to the West Indies, it touched off an international incident. Earlier in the year, President Abraham Lincoln had proclaimed a blockade of Southern ports, after which Great Britain and France commenced a policy of neutrality that carried with it the rights of belligerent action by the Confederacy. It was the only important concession made to the Confederate states by European powers during the war. The Confederate commissioners in Britain at that time were a poor lot, while the United States foreign minister, Adams, the son of former President John Quincy Adams, was a skilled diplomat who had been urged by Secretary of State William H. Seward to be bold in asserting American rights. Confederate diplomacy in Europe was more complacent, based on a belief in the economic power of “King Cotton” upon which British and French mills were dependent. Confederate President Jefferson Davis subscribed to this view. Prior to the war, England and Europe had imported nearly 85 percent of their cotton from the South. Nearly one-fifth of the British population earned its livelihood from the cotton industry, while one-tenth of Britain’s capital was invested in cotton as well. However, there was no official Confederate policy to produce a phony cotton famine in Europe or rush cotton abroad to fill the coffers of the South. It would be a short war, in Davis’s view. If it lasted longer, a concomitant cotton famine would inevitably bring Great Britain into the war to safeguard her economic interests and rescue the South. 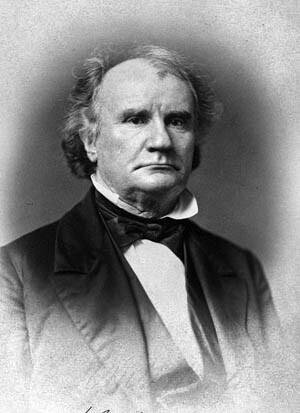 William L. Yancey had resigned as Confederate envoy to Britain. In his place, Davis assigned a pair of trusted political cronies to represent Southern interests in London and Paris. 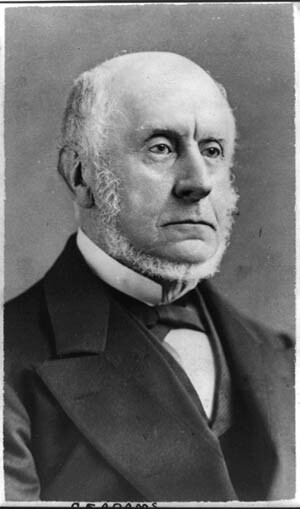 James M. Mason, Yancey’s replacement, was a strange choice in the view of well-connected political wife Mary Boykin Chesnut, who wrote in her diary: “My wildest imagination will not picture Mr. Mason as a diplomat. He will say ‘chaw’ for ‘chew’ and he will call himself ‘Jeems’ and he will wear a dress coat to breakfast. Over here whatever a Mason does is right. He is above the law.” His Paris-based associate John Slidell was a better choice. Slidell was a skilled politician and sophisticated New Yorker who had married a French-speaking Creole and moved to New Orleans. Two days later the diplomats arrived in Nassau but missed their connection with a British steamer. They turned for Cuba, hoping to find a British mail ship bound for England. 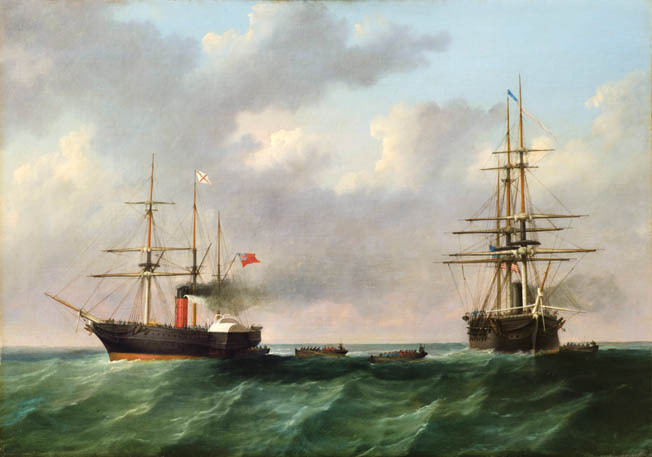 Arriving in Cuba on October 15, they found that British mail ships did dock at Havana but that they would have to wait three weeks for the next ship, RMS Trent. Union intelligence sources thought Mason and Slidell had escaped aboard Nashville. Thus the U.S. Navy dispatched James Adger, commanded by John B. Marchand, with orders to intercept Nashville. On October 3 the Union steam frigate San Jacinto, commanded by 62-year-old Captain Charles D. Wilkes, arrived at St. Thomas in the Danish West Indies. He was hunting the Confederate raider CSS Sumter. Wilkes, a gifted astronomer, had experienced many ups and downs in his naval career. Early on, he had won accolades for his voyages of discovery to Antarctica and the Fiji Islands. But repeated displays of bad temper and insubordination had landed him in hot water with his superiors, and Wilkes had been shunted aside to a minor bureaucratic desk in Washington before receiving orders to take command of the steam warship San Jacinto on patrol off the coast of West Africa. He was directed to sail the ship home for refitting. Characteristically disobeying orders, Wilkes determined instead to prowl the West Indies for Rebel shipping. In Cienfuegos, on the southern coast of Cuba, Wilkes learned from a newspaper that Mason and Slidell were in Havana waiting to take passage on Trent, sailing first for St. Thomas and then on to England. Wilkes knew that Trent would have to use the Bahama Channel between Cuba and the Great Bahama Bank. He thought over the legal implications of trying to remove the Confederate envoys from the British vessel, asking the opinion of his executive officer, Lieutenant D.M. Fairfax. He decided that Mason and Slidell could be considered “contraband” and legally seized. Trent left Havana on November 7 with Mason and Slidell on board; Slidell was accompanied by his wife and children. Diplomatic secretaries James E. Macfarland and George Eustis were also part of the official company. Passing through the Bahama Channel they found San Jacinto waiting. The Federal ship spotted Trent about noon on November 8; the mail ship was flying the Union Jack. Wilkes ordered a shot fired across Trent’s bow. It was ignored. A second shot landed close to the bow. Trent hove to. Wilkes gave detailed instructions to Fairfax. “Should Mister Mason, Mister Slidell, Mister Eustis and Mister Macfarland be on board,” he said, “make them prisoners and send them on board this ship immediately and take possession [of the Trent] as a prize.” Fairfax was also instructed to seize any dispatches and official correspondence he might find. Initiating a major diplomatic flap, Union Navy Lieutenant D.M. Fairfax leads a two-boat boarding party from USS San Jacinto, right, toward the British mail steamer Trent on the afternoon of November 8, 1861. Armed with cutlasses and pistols, Fairfax and a boarding party of 20 men approached Trent in two cutters. Fairfax boarded alone, not wishing to enflame the situation, but found Captain James Moir furious that his ship had been stopped at sea. Fairfax told him his orders, Moir refused to cooperate, and Fairfax soon found himself surrounded and threatened by passengers and crew. He had little choice but to order the armed party in the waiting boats to join him. Once again Moir refused permission for the boarding party to search the ship. Mason and Slidell came forward willingly, and Fairfax backed down, belatedly realizing that such a search would constitute a de facto seizing of the ship—a clear act of war. Mason and Slidell formally refused to go with Fairfax but did not resist when led to the boats. Wilkes had hoped to find important documents in the captured men’s luggage but found nothing. All their dispatches had been taken in hand by Trent’s mail agent, Richard Williams, who promised to deliver them to Confederate authorities in London. In the meantime, Slidell’s furious wife and daughters heaped verbal abuse on the Union sailors, even after Fairfax grabbed one of the daughters and saved her from falling overboard after a sudden wave. Wilkes was still keen to seize Trent, but Fairfax talked him out of it. A prize crew would be needed, he warned, and the inconvenience to Trent’s other passengers and mail recipients was unacceptable. Wilkes reluctantly agreed, and Trent was allowed to proceed on her way. Meanwhile, San Jacinto reached Hampton Roads on November 15 for coaling, and Wilkes was able to contact Washington. He was ordered on to Boston, where his captives were imprisoned in Fort Warren. A congratulatory telegram was waiting for Wilkes from Secretary of the Navy Gideon Welles. “Your conduct in seizing these public enemies was marked by intelligence, ability, decision, and firmness, and has the emphatic approval of this Department,” Welles informed him. Others in the North likewise praised Wilkes and his crew. Congress thanked him for his “brave, adroit and patriotic conduct in the arrest of the traitors” and had a gold medal struck for him. He was the toast of Boston and celebrated throughout the country as a hero of the republic. The New York Times stoked the patriotic fervor. “We do not believe the American heart ever thrilled with more genuine delight than it did yesterday, at the intelligence of the capture of Messrs. Slidell and Mason,” the newspaper reported. To a Northern public conditioned to believe that Great Britain was decidedly pro-Confederate, the Trent affair seemed like a perfect way to put the haughty Britons in their place. Adams was not at the legation when the news arrived. He was in Yorkshire in the north of England enjoying the hospitality at Fryston Hall as the guest of socialite-politician Richard Monckton Milnes. Moran sent a panicky message to Adams, but the veteran diplomat did not feel the need to hurry back. Finally returning to London, Adams found a note from Foreign Secretary Lord Russell on his desk, but it was late in the day and Adams responded that he would see him the next day. He found his British counterpart with “a shade more of gravity visible in his manner, but no ill will.” The meeting lasted a mere 10 minutes, Adams recalled, but “I scarcely remember a day of greater strain in my life.” What had been feared might happen with James Adger had come to pass with San Jacinto. Adams doubted that two Confederate envoys were all that important. Captain (later Admiral) Charles D. Wilkes. Recent dispatches from Lord Lyons, British ambassador to the United States, were read at the meeting. 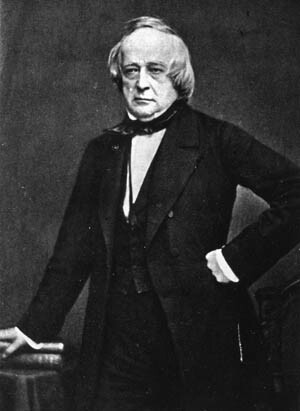 Lyons warned that American Secretary of State Seward might provoke an incident and that the United States then would have difficulty in climbing down. He recommended a show of force, including reinforcing the garrison in Canada. Lord Somerset, the First Lord of the Admiralty, was against Palmerston’s wish to reinforce Rear Admiral Sir Alexander Milne’s North American and West Indies fleet, arguing that Milne already had enough ships superior to those of the United States and that there was no point incurring unnecessary expense. This view had support in both the Houses of Commons and Lords. The country was clamoring for war. All concurred that the American seizure was unlawful. However, at the November 19 cabinet meeting the ministers could not agree on the response they should make to the Americans. William Gladstone, Chancellor of the Exchequer, argued that too strong a response would leave the Americans no room to maneuver. Palmerston countered that too weak a response would give the United States the wrong impression of Great Britain’s resolve. It was decided to leave the drafting of the letter to Foreign Secretary Lord Russell. Russell’s letter stated the facts of the case and demanded the restoration of the Confederate commissioners and a formal apology within seven days of receiving the letter. Failure to comply would mean the immediate departure of Lord Lyons to Canada and a de facto state of war between the two nations. The cabinet reconvened the next day to examine Russell’s draft letter. Some felt the meaning was unclear, and Russell became defensive. Finally, it was agreed that Lord Lyons would be sent two letters—the first a basic outline of the case, the second containing the threat of war within seven days. Gladstone began backtracking, saying he was not even sure the law was on their side, even though there was no doubt that Wilkes had violated international law. After long hours of debate, the cabinet officers agreed to send the letters to the queen for her approval. Trent’s British captain, James Moir, defiantly refused to cooperate with Fairfax and his boarders, but Confederate emissaries James M. Mason and John Slidell came forward voluntarily to avoid bloodshed. It was a loophole, an exit route that would allow the American government to withdraw with honor. 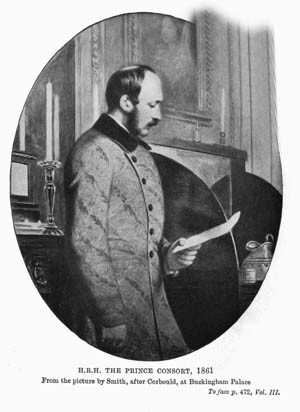 This redrafting by Prince Albert was the last service he performed for his adopted country. When he presented the document to the queen for her signature, he complained, “I feel so weak I have hardly been able to hold my pen.” He collapsed the next day and died 12 days later at the age of 42. Victoria mourned him for the rest of her lengthy life, always wearing widow’s black. 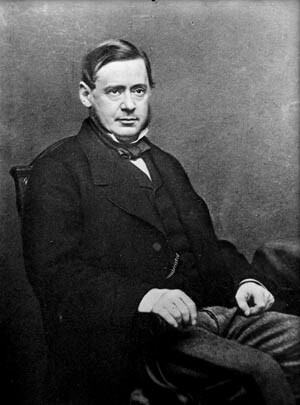 Lord Russell agreed with the prince’s additions and changes but still doubted that Seward would climb down. He composed a third letter to Lyons outlining the presentation of Her Majesty’s demands. Above all, the Confederate commissioners must be released from prison. No apology would appease Britain if they were kept in custody. There was to be no bargaining on that point. 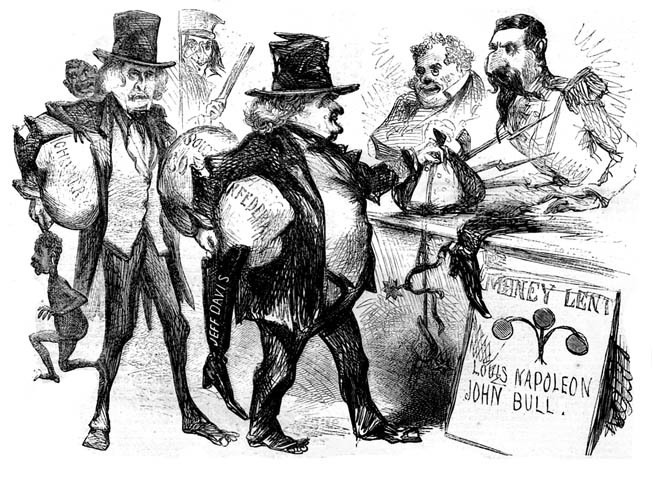 An anti-Confederate cartoon shows James M. Mason and John Slidell carrying bales of cotton as they approach money lenders Napoleon III of France and English representative “John Bull.” Two crudely sketched slaves are visible in the rear. On December 3, another cabinet meeting was held after it was revealed that United States agents had been buying up Britain’s entire saltpeter reserves, most of it due to be shipped. An immediate export ban was put into effect. The Americans, lacking their own supplies of saltpeter, would be severely restricted in the production of gunpowder by this action. An arms and ammunition ban was also instituted, and the Admiralty issued a worldwide alert to the fleet to prepare for action. The first wave of 11,000 troops for Canada left Southampton. Charles Francis Adams, American ambassador to Great Britain. Back in Washington during the first week of December, many were hopeful that Britain would take no action in the wake of the Trent seizures. The arrival of British newspapers on December 13 changed all that, leaving no doubt that Her Majesty’s government would demand reparations and that Wilkes was thought to have acted unlawfully. Secretary of State Seward had openly favored war with Britain as a means of uniting the divided country. He thought the South would drop their brothers’ quarrel and support the nation against the foreign power. Clearly he was mistaken, since one of the South’s main aims was to draw Britain into the conflict on their side, with the hope that France would follow. Lincoln, for his part, had doubted the wisdom of Wilkes’ actions from the start, fearing that “the traitors will prove to be white elephants.” Still new to international affairs, the president was willing to leave the matter in Seward’s hands—for the time being, anyway. Seward soon found that what he thought he had wanted—war with Great Britain—was not an open-and-shut matter. Seward now saw, as did Lincoln, that what Wilkes had done in stopping Trent and removing the two Confederate diplomats was no different from what the British had done to American ships before the War of 1812. They had to stick to the principle of the rights of neutrality at sea. “One war at a time,” said Lincoln, and Seward agreed. Still, they had no wish to antagonize public opinion and said nothing publicly. In his December 1 message to Congress, Lincoln did not even mention the Trent affair, much to the surprise of the body’s members. Lord Lyons, British ambassador to the United States. On December 18, just before midnight, an exhausted Captain Conway finally reached Lord Lyons’ house in Washington. At 3 pm the next day Lyons presented himself at Seward’s office and delivered the queen’s letter. Seward asked Lyons what would happen if they refused the stated demands or asked for more discussions. Lyons replied, “My instructions were positive and left me no discretion.” Seward asked for more time; it could not be done in seven days. Lyons agreed to come back in two days, when the clock to war would start ticking. Going home, Lyons doubted that an extension of time would make much difference. He sent a coded telegram to Admiral Milne to make ready to evacuate the legation staff to Canada. Returning to Seward on Saturday, December 21, Lyons was confronted with another request for two more days. Lyons was not the type to ignore his instructions, but he realized that Seward was in a tight corner. He also knew that a letter from France formally supporting Britain’s position would arrive later that day. A new appointment was set for Monday, but Lyons made it clear that this must be the final meeting on the matter. On December 23, Lyons officially delivered Russell’s letter to Seward at the State Department. There was no immediate reply. Lyons had done all he could to help the Americans by delaying, but now the clock was ticking. Seward got Lincoln to call a cabinet meeting for Christmas Day, at which copies of Russell’s letter were given to the members. It soon became apparent that most were against releasing the Confederate envoys. Massachusetts Senator Charles Sumner spoke up, saying that the release of the prisoners would be political suicide; arbitration was the only possible course. However, even as Sumner was speaking news arrived of the official French support for Britain. The room was stunned. Attorney General Edward Bates pointed out that Sumner’s suggestion would not work. Britain’s navy would crush their own and ruin overseas trade, and the nation would be bankrupt. There was already a run on the banks. The cabinet adjourned in the afternoon, agreeing to reconvene the next day. Lincoln, still clinging to the notion of international arbitration of the crisis, asked Seward to present his arguments on compliance in writing the next day, and he would do the same for the arbitration case. By the next day, most of the cabinet members had come around to Seward’s view that the United States had little choice but to comply with British demands. 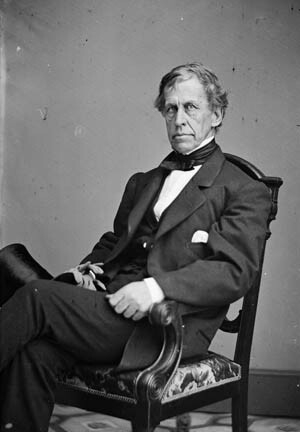 Seward had been up all night drafting a 26-page response to Lord Russell in which he clearly laid the blame on Captain Wilkes and his failure to take Trent to a prize court. Seward showed the draft to Secretary of the Treasury Salmon P. Chase, who seconded the idea of releasing the Confederate commissioners. Prince Albert, husband and consort of Queen Victoria. When Confederate ambassadors Mason and Slidell finally arrived at Southampton, England, in February 1862, Queen Victoria refused even to receive them. Cheap Indian cotton obviated the need for continued ties to the South. Mason and Slidell were duly removed from Fort Warren and put aboard the HMS Rinaldo at Provincetown, Massachusetts, and transported to St. Thomas in the Caribbean. On January 14, the diplomats boarded the British mail steamer La Plata for the final leg of their long and torturous journey. When the Confederate envoys arrived in Southampton early in February, it was barely reported in the British press. The nation, like the queen, was still wrapped in mourning for the late Prince Albert. Victoria refused even to receive the visitors. Lord Russell told Lord Lyons, “What a fuss we have had about these two men.” The soldiers Britain had sent to Canada at great expense remained there for some time. They got bored with little to do; some even deserted to America and joined the Union Army. Tags Abraham Lincoln, Blunderbuss, Confederacy, James M. Mason, Jefferson Davis, Lord Palmerston, Napoleon III, Nashville, New Orleans, Queen Victoria, Richmond, Royal Air Force, San Jacinto, Trent Affair, Union Army, Union Navy, William E Seward, William Gladstone.